Oysteria has kept the rectangular bar in the dining room from Olives but replaced the wood top with white marble. The new restaurant in Charlestown’s City Square has yet to serve a meal to the public, but the place already has a history. It occupies the space that for years was home to celebrity chef Todd English’s signature restaurant, Olives, which has been dark for more than year. On Wednesday, the lights will come back on as Roger Berkowitz unveils his latest “one-off” neighborhood establishment, Legal Oysteria. 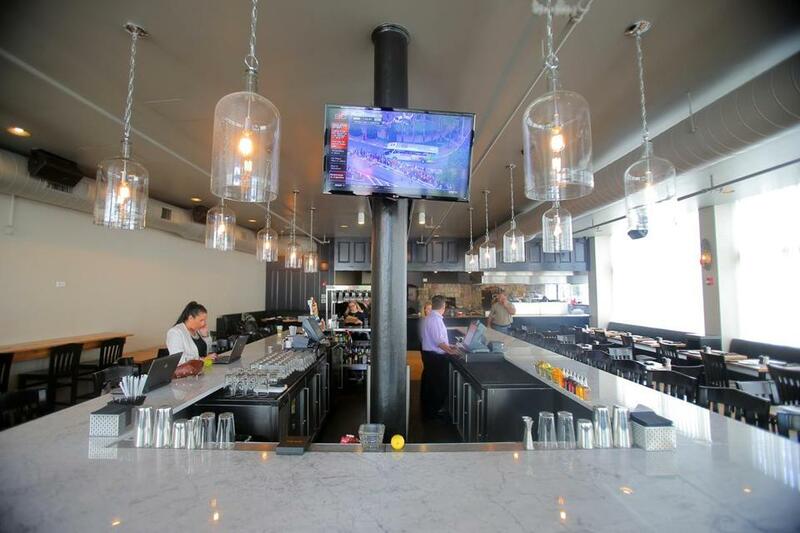 The chief executive of the massively popular Legal Sea Foods chain says it will be followed at summer’s end by yet another restaurant, Legal on the Mystic, at Assembly Row in Somerville. Both are part of an effort by the company to diversify and attract a wider range of customers. In Charlestown, Berkowitz has tossed out the standard Legal menu — which features baked, fried, and grilled fish dishes — and replaced it with light coastal Italian cuisine cooked in a brick oven. Welcome to Legal Oysteria, opening Wednesday in Charlestown’s City Square. He’s also keenly aware of the site’s storied and tumultuous history. When English opened Olives in 1989, it revolutionized the local food scene. The open-kitchen concept he favored was rare at the time, and dishes he served — such as butternut squash tortellini — were more adventurous than the typical fare at Boston restaurants. But as English’s fame and business empire grew on a national level, he had less time to spend on his signature local restaurant, which many say suffered as a result. 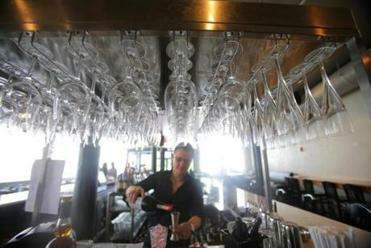 In 2010, a kitchen fire caused serious damage and Olives closed for two years. Its reopening in 2012 was short-lived — the restaurant shuttered for good in June 2013. Berkowitz signed a lease on the property last November but couldn’t acquire the liquor license until English satisfied unpaid state employment taxes in April. Although Legal Oysteria is far different from Olives, some of English’s influence remains. Legal refurbished the brick oven, a focal point of the open kitchen. The wraparound rectangular bar in the center of the dining room also stayed, with the wood top replaced by white marble. The former restaurant’s warm, earthy tones have been replaced with a sleek navy blue, gray, and black scheme. White curtains hang from the floor-to-ceiling windows. Some other old features, such as the clear glass jug lanterns that dangle above the bar, remain. The food is inspired by the brick oven and the Italian heritage of Legal’s top two chefs. The “Oysteria” name is a play on a traditional osteria, a style of unpretentious cafes in Italy known for serving simple food and good wine. In keeping with that idea, executive chef Rich Vellante and restaurant chef Gina Palmacci have come up with dishes such as Ligurian fish stew ($22) and swordfish salmoriglio ($25). Legal Oysteria will also serve brick oven pizzas, including margherita ($10), roasted clam ($11), and sopressata ($12), as well as small plates including warm marinated olives ($3) and a grilled oyster with fennel butter ($3). Partially motivated by Berkowitz’s grain-free personal diet, there will also be an assortment of gluten-free dishes. In Somerville, Legal intends to emphasize the area’s industrial history. The design of Legal on the Mystic will include steel pipes, metal mesh, concrete, and brick balanced by wood accents. An open kitchen will act as the dining room’s backdrop. The restaurant will include a large beer cooler and wine display and garage doors opening to outdoor seating. A final menu has not been determined, the company said. Berkowitz said he views Somerville as the “it” city outside Boston and was drawn to the location’s accessibility.